Their lodge is near excellent big game hunting, their camp is in the Bridger-Teton Forest in the Wyoming Range. Elk, deer, moose and antelope hunting. For 22 years, Joe Gonzalez has guided fishermen from Biscayne Bay to the Florida Keys to the Everglades to Flamingo. He specializes in flyfishing and light tackle fishing for bonefish, permit, tarpon, redfish, snook, trout, shark and barracuda. Contact Captain Joe today to book a trip. Wilderness fishing trips and hunting outfitters (elk, moose, deer, bighorn sheep) in the Gros Ventre and Bridger Wilderness areas of the Bridger-Teton National Forest in Wyoming. Black Diamond Outfitting, Fishing and Hunting Outfitters in Wyoming. Wyoming hunting lodge offers guided bird and game hunting trips, including deer, buffalo, antelope, prairie dogs, pheasants, and coyotes. Wyoming Hunting Lodge with excellent Mule Deer, Antelope, Buffalo, Prairie Dog, Pheasants, and Coyote Hunting. The Wyoming Game and Fish Department Home Page. 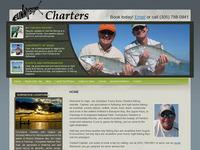 Informative and Reliable information for todays sportsmen and outdoor enthusiasts.